The famous Aegis Patrol Portable Appliance Tester. Protect yourself and your employees by ensuring that your portable electrical appliances and equipment are tested for electrical safety to AS/NZS 3760:2010 with the CZ5000 Patrol. The Aegis Patrol is a reliable portable appliance tester (PAT) and is an essential piece of equipment for every workplace. You can make sure that your business is complying to OH&S standards by testing all of your electrical appliances with the Patrol. It will perform the essential electrical safety tests required for portable appliances and equipment, and can be used to test domestic appliances, industrial appliances, power tools, electrical portable outlet devices and extension leads. It is designed to meet Australian and New Zealand safety requirements. All components of the Patrol are contained in a waterproof, drop proof case. All test leads are also supplied with the CZ5000 so you can start testing as soon as you take it out of the box. Everything is tested to the Australian and New Zealand Standard (3760) relating to appliance testing. The Patrol is the simplest PAT on the market. 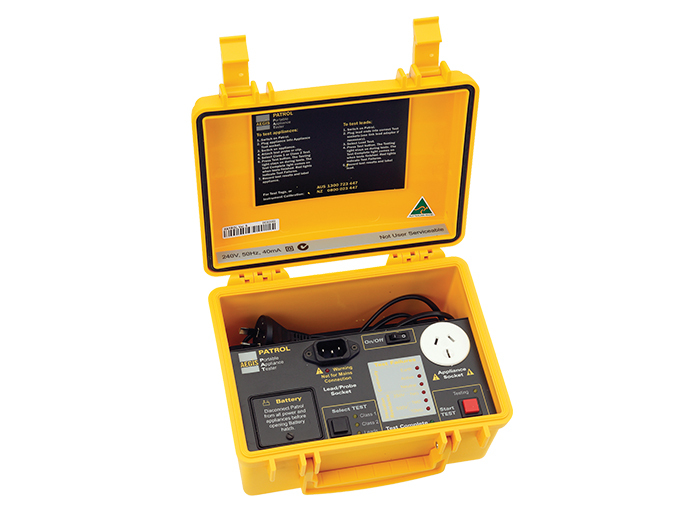 A fully portable appliance tester, the CZ5000 Patrol can operate from batteries or from a 240V AC supply, adding to its convenience. To operate you simply select the appliance type and press the "Start Test" button. The Patrol automatically selects the appropriate test sequence of Earth Bond, Insulation, and Continuity/Polarity Tests. All pass and fail results are displayed at the end of the test. If you are looking to test appliances, power boards or extension leads, and need a sturdy and dependable portable appliance tester, then the CZ5000 is the unit for you. There are many PATs on the market but you won’t find one of a higher quality than the CZ5000 Aegis Patrol. This 3 phase adaptor can extend the testing functionality of your portable appliance tester into a 3 phase PAT, enabling testing of 3 phase phase portable appliances. Compatible with most PATs, the adaptor saves you the expense of buying a dedicated 3 phase PAT. This 3 phase adaptor caters for both 4-pin(20A) and 5-pin(32A) appliances.